Sir John Grey Gorton, GCMG, AC, CH (9 September 1911 – 19 May 2002), Australian politician, was the 19th Prime Minister of Australia. Gorton was born near Melbourne, the illegitimate son of Alice Sinn, the daughter of a railway worker, and English orange orchardist John Rose Gorton. The older Gorton and his wife Kathleen had emigrating to Australia by way of South Africa, where they had prospered during the Boer War. They separated in Australia and John senior established a de facto relationship with Sinn, who died of tuberculosis in 1920. John junior then went to live with his father's estranged wife and his half-sister Ruth, in Sydney. He was educated at Sydney Church of England Grammar School, Geelong Grammar School and then travelled to England to attend Brasenose College, Oxford. While in England, Gorton also undertook flying lessons and was awarded a British pilots' licence in 1932. He studied history, politics and economics at Oxford and graduated with an upper second undergraduate degree. While he was at Oxford, Gorton met Bettina Brown of Bangor, Maine — USA, a language student at the Sorbonne — during a holiday in Spain. In 1935, they were married and settled in Australia, taking over his father's orchard, "Mystic Park", at Lake Kangaroo near Kerang. They had three children: Joanna, Michael and Robin. On 31 May 1940, following the outbreak of World War II, Gorton enlisted in the Royal Australian Air Force Reserve. At 29, he was considered too old for pilot training, but he re-applied in September after this rule was relaxed. Gorton was accepted and commissioned into the RAAF on November 8, 1940. He trained as a fighter pilot at Somers, Victoria and Wagga Wagga, before being sent to the UK. Gorton completed his training at RAF Heston and RAF Honiley, with No. 61 Operational Training Unit RAF, flying Supermarine Spitfires. He was disappointed when his first operational posting was No. 135 Squadron RAF, a Hawker Hurricane unit, as he considered the type greatly inferior to Spitfires. During late 1941, Gorton and other members of his squadron became part of the cadre of a Hurricane wing being formed for service in the Middle East. They were sent by sea, with 50 Hurricanes in crates, travelling around Africa to reduce the risk of attack. In December, when the ship was at Durban, South Africa, it was diverted to Singapore, after Japan entered the war. As it approached its destination in mid-January, Japanese forces were advancing down the Malayan Peninsula. The ship was attacked on at least one occasion by Japanese aircraft, but arrived and unloaded safely after tropical storms made enemy air raids impossible. As the Hurricanes were assembled, the pilots were formed into a composite operational squadron, No. 232 Squadron RAF. In late January 1942, the squadron became operational and joined the remnants of several others that had been in Malaya, operating out of RAF Seletar and RAF Kallang. During one of his first sorties, Gorton was involved in a brief dogfight over the South China Sea, after which he suffered engine failure and was forced to land on Bintan island, 40 km (25 mi) south east of Singapore. As he landed, one of the Hurricane's wheels hit an embankment and flipped over. Gorton was not properly strapped in and his face hit the gun sight and windscreen, mutilating his nose and breaking both cheekbones. He also suffered severe lacerations to both arms. He made his way out of the wreck and was rescued by members of the Royal Dutch East Indies Army, who provided some medical treatment. Gorton later claimed that his face was so badly cut and bruised, that a member of the RAF sent to collect him assumed he was near death, collected his personal effects and returned to Singapore without him. By chance, one week later, Sgt Matt O'Mara of No. 453 Squadron RAAF also crash landed on Bintan, and arranged for them to be collected. They arrived back in Singapore, on February 11, three days after the island had been invaded. As the Allied air force units on Singapore had been destroyed or evacuated by this stage, Gorton was put on the Derrymore, an ammunition ship bound for Batavia (Jakarta). On February 13, as it neared its destination, the ship was torpedoed by a Japanese submarine and the Derrymore was abandoned. Gorton then spent almost a day on a crowded liferaft, in shark-infested waters, with little drinking water, until the raft was spotted by HMAS Ballarat, which picked up the passengers and took them to Batavia. Although Gorton had been a member of the Country Party before the war, in 1949 he was elected to the Senate for the Liberal Party. He served in various positions under Robert Menzies and Harold Holt, including Minister for the Navy, Minister for Works, Minister for the Interior and Minister for Education as well as Leader of the Government in the Senate. Gorton was an energetic and capable minister, and began to be considered leadership material once he moderated his early extremely right-wing views. Harold Holt disappeared while swimming on 17 December 1967 and was declared presumed drowned two days later. His presumed successor was Liberal deputy leader William McMahon. However, on 18 December, the Country Party leader and Deputy Prime Minister John McEwen announced that the Country Party would not continue to serve in the coalition if McMahon were to be the new Liberal leader. His reasons were never stated publicly, but in a private meeting with McMahon, he said "I will not serve under you because I do not trust you". McEwen's shock declaration triggered a leadership crisis within the Liberal Party; even more significantly, it raised the threat of a possible breaking of the Coalition, which would spell electoral disaster for the Liberals -- they were only able to win and hold power with Country Party support, and the Liberal Party had never won sufficient seats in any federal election to be able to govern in its own right. The Governor-General Lord Casey swore McEwen in as Prime Minister, on an interim basis pending the Liberal Party electing its new leader. McEwen agreed to accept an interim appointment provided there was no formal statement of time limit. This appointment was in keeping with previous occasions when a coalition conservative government had been deprived of its leader. Casey also concurred in the view put to him by McEwen that to commission a Liberal temporarily as Prime Minister would give that person an unfair advantage in the forthcoming party room ballot for the permanent leader. In the subsequent leadership struggle, Gorton was championed by Army Minister Malcolm Fraser and Liberal Party Whip Dudley Erwin, and with their support he was able to defeat his main rival, the Minister for External Affairs Paul Hasluck, to become Liberal leader even though he was a member of the Senate. He was elected party leader on 9 January 1968, and appointed Prime Minister on 10 January, replacing McEwen. He became the only Senator in Australian parliamentary history to be Prime Minister. He remained a Senator until, in accordance with the Westminister tradition that the Prime Minister is a member of the lower house of parliament, he resigned on 1 February 1968 in order to contest the House of Representatives by-election for the electorate of Higgins (necessitated by Holt's death). That by-election was held on 24 February; there were three other candidates, but Gorton achieved a massive 68% of the formal vote. He visited all the polling booths during the day, but was unable to vote for himself as he was still enrolled in the western Victorian seat of Mallee. Between 1 February and 24 February he was a member of neither house of parliament. Gorton was initially a very popular Prime Minister. He carved out a style quite distinct from those of his predecessors - the aloof Menzies and the affable, sporty Holt. Gorton liked to portray himself as a man of the people who enjoyed a beer and a gamble, with a bit of a "larrikin" streak about him. Unfortunately for him, this reputation later came back to haunt him. He also began to follow new policies, pursuing independent defence and foreign policies and distancing Australia from its traditional ties to Britain. But he continued to support Australia's involvement in the Vietnam War, a position he had reluctantly inherited from Holt, which became increasingly unpopular after 1968. On domestic issues, he favoured centralist policies at the expense of the states, which alienated powerful Liberal state leaders like Sir Henry Bolte of Victoria and Sir Robert Askin of New South Wales. He also fostered an independent Australian film industry and increased government funding for the arts. Gorton proved to be a surprisingly poor media performer and public speaker, and was portrayed by the media as a foolish and incompetent administrator. He was unlucky to come up against a new and formidable Labor Opposition Leader in Gough Whitlam. Also, he was subjected to media speculation about his drinking habits and his involvements with women. He generated great resentment within his party, and his opponents became increasingly critical of his reliance on an inner circle of advisers - most notably his private secretary Ainsley Gotto. At the 1969 elections, the Coalition lost the two-party preferred vote, but the Democratic Labor Party's longstanding practice of preferencing against Labor allowed the Coalition to win enough seats to stay in office. The Coalition lost most of the sizeable majority in the House of Representatives they had inherited from Holt - it was reduced from 45 seats to seven. After the election, Gorton was challenged for the Liberal leadership by David Fairbairn, but so long as McEwen's veto on McMahon remained in place, he was fairly safe. McEwen retired in January 1971, and his successor, Doug Anthony, told the Liberals that the veto no longer applied. With the Liberal Party falling further behind Labor in the polls, a challenge was launched in March with the resignation of the Defence Minister, Malcolm Fraser, who attacked Gorton on the floor of Parliament in his resignation speech, saying that Gorton was "not fit to hold the great office of Prime Minister." Gorton called a Liberal Party meeting to settle the matter. A motion of confidence in his leadership was tied. He could have kept his position by using his casting vote but he chose to resign, and McMahon was then elected leader and thus Prime Minister. In a surprise move, Gorton contested and won the position of Deputy Leader, forcing McMahon to make him Defence Minister. This farcical situation ended within a few months when McMahon sacked him for disloyalty. After Labor won the 1972 election, Gorton served in the Shadow Ministry of Billy Snedden until after the 1974 election, when he was dropped. When Fraser became Liberal leader in 1975, Gorton resigned from the party and sat as an independent. He denounced the dismissal of the Whitlam government by Sir John Kerr, and unsuccessfully stood for an Australian Capital Territory Senate seat at the 1975 election as an independent. Gorton retired to Canberra, where he kept out of the political limelight, although he quietly rejoined the Liberal Party. Bettina Gorton died in 1983, and in 1993 he remarried Nancy Home. In his old age he was rehabilitated by the Liberals; his 90th birthday party was attended by Prime Minister John Howard. He died in his ninety-first year in Sydney. 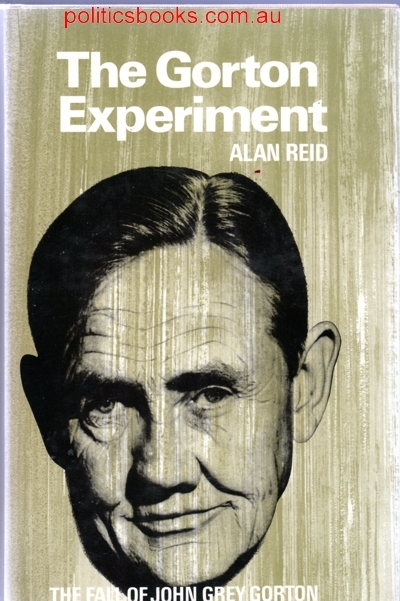 The journalist Alan Reid served in the Federal Parliamentary Press Gallery from 1937 to 1985. Over this extensive period he accumulated a distinctive persona. His colleagues in Parliament House came to regard him as the ultimate old-style working journalist, subsisting on hand-rolled cigarettes and leaks from his sources. And yet his hard-bitten exterior was not the whole story. Reid was never just a lowly hack. Far from merely reporting events, he was an insider who helped to shape them.